I live in a tropical climate, hence sudden showers and downpours are inevitable. I'm always very cautious to make sure my belongings don't get wet or damaged in the rain. It'll be absolutely disasterous if your gadget gets soaked or if your work gets smudged! Moreover, I'm especially careful when it comes to leather bags, for I don't like my leather to be exposed to the rain. Excessive moisture is harmful and can cause mold to grow on the leather. Even more so for delicate hide such as lambskin or calfskin. 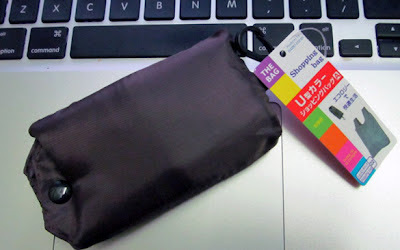 I found these foldable shopping bags at the local daiso. It's convenient and affordable. It can double up as a recycling bag when not protecting the prized leather bag from rain. Doing a good deed for the environment too! There are various size available, and the largest nylon ones can even fit the bigger leather tote bags. Definitely useful for someone always on the go.